Find parks, oceans, marinas, and other places to fish in NY. Enjoy trout fishing, fly fishing, and other types of NY fishing after scrolling through our informative, comprehensive guide to outdoor activities in the state. Make the most out of your weekend with the family by going fishing in NY at one of these beautiful locations. Go Fishing in New York for the Whole Day! Setting sail daily from City Island in New York, Island Current Fishing Fleet consists of four U.S. Coast Guard inspected and licensed fishing boats. When you charter a boat from the fleet, you can use it for the entire day. 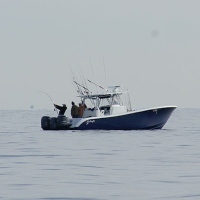 The charters generally leave around 7 A.M. and return at approximately 4:30 P.M. The price of your fishing charter includes all custom tackle, rods, reels, and bait. 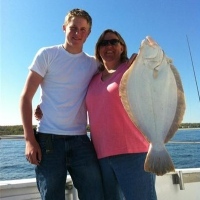 Depending on the season you can fish for flounder, fluke, striped bass, bluefish, porgy, blackfish, codfish, weakfish, or other species of fish. The fleet is also available for sight-seeing and cruises. Browse the website to view a list of specialty trips currently available. 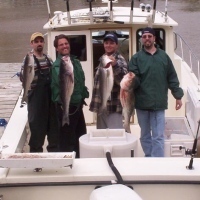 First-Class Fishing Charters in NY! 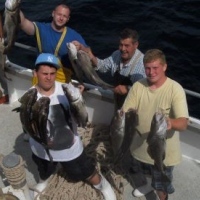 Marilyn Jean Charters boasts a courteous crew with 50 years of combined experience fishing in the NY/NJ area. 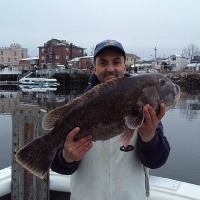 Throughout the year, the company schedules fishing trips targeting such species as fluke, flounder, striped bass, weakfish, bluefish, sea bass, porgies, blackfish, ling, cod, and others. Special fishing discounts are available for groups. The boat is U.S. Coast Guard inspected and certified to carry up to 6 passengers. All bay fishing trips include bait and if you don't have your own fishing equipment, it can be lent to you free of charge. If you and your group would like the entire boat to yourselves, Marilyn Jean allows you to schedule private fishing and cruising charters. The marina is conveniently located, only a few blocks away from the Sheepshead Bay subway station. A Super-Fast Fishing Boat in NY! The Brooklyn VI has offered a high standard of fishing and service since 1970. The modern 110' long and 26' wide super cruiser is known as one of the largest fishing boats in New York. The super-fast boat can exceed speeds up to 24 knots! Plus, it can accommodate up to 150 passengers and fish up to 120 passengers. The boat's spacious cabin can seat over 100 passengers, and is fully equipped with air conditioning during the hot summer days and heating during the frigid winter days. While on your daytime or nighttime fishing trip, you can either bring your own equipment or rent brand new rods and reels, as the boat always carries a large assortment of bait and tackle. During your trip, if you have any questions, feel free to ask one of the experienced crew members. Two Great Boats for Fishing in NY! One of the great New York fishing boats; the Celtic Quest IV is a comfortable, clean, and exceptional cruising platform that is now equipped with the latest top-of-the-line fishing electronics. The boat's large sun deck is perfect for parties and cruises. The boat sets sail daily as an open boat, but is also available for private charters for groups of up to 100 people. Once you charter the boat, you can determine what to fish for, as well as what time to leave and come back. All bait and custom fishing tackle are included. The original Celtic Quest boat is an incredible, 60-foot, clean, and comfortable party fishing boat. The crew prides itself on maintaining the vessel 100%. Celtic Quest was built by master boat builders, and the crew does its best to keep it in pristine condition. High-Tech Fishing Charters in New York! Experience NY fishing at its best while aboard a sensational center console fishing boat at Long Island Fishing Charters! The boat is equipped with such technology as SIMRAD Radar, GPS, Sonar, and VHF units. The front seats and the console both contain plenty of storage. If you're planning a fishing trip, the boat can comfortably fit up to 4 anglers. 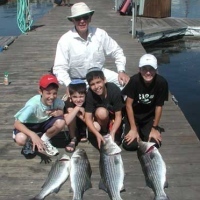 The NY fishing charters are located on the Manhasset Bay Marina. Overlooking the marina is LaMotta's Waterside Restaurant, which serves some of the most delicious continental cuisine. Check the website for additional local dining and lodging options in the area. Go Fly Fishing in NY! A premiere light tackle and charter fishing operator; Manhattan Fly allows you to go trolling or fly fishing in the Upper and Lower New York Bays. With over 13 years of experience fishing in New York, Captain Chris Hessert possesses an immense knowledge of all of NY's fishing hotspots, and will lead you on a fishing expedition you won't soon forget! On your charter you will be provided such fishing equipment as spinning reels, trolling reels, fly rods, fly reels, tuna rods, and big game fly reels. The boat's marina is conveniently located only minutes away from Manhattan, in the Newport Marina in Jersey City, NJ. You can either commute to the marina via Path Train or through the Holland Tunnel. Ample parking is always available. Your New York Fishing Headquarters! Established in New York in 1897, Capitol Fishing Tackle Company provides one of the most comprehensive selections of fresh and saltwater fishing rods, reels, equipment, and accessories. 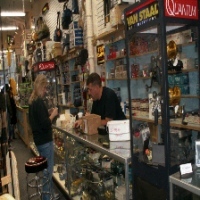 The knowledgeable staff will be more than happy to offer you expert advice in choosing from the enormous inventory. The store is an authorized dealer of such popular fishing brands as Shimano, Daiwa, Penn, G Loomis, Avet, and St. Croix. If you're commuting via subway, Capital Fishing is conveniently located near Penn Station and Herald Square. Before you seek out the coolest places to go fishing in New York, pay a visit to the state's best and oldest fishing tackle store! Whether you're a beginning or experienced angler, Lady L Charters provide you with the ultimate fishing experience! Captain Rudy and his mates will guarantee that your trip is both safe and enjoyable. The boat accommodates up to 6 passengers, with comfortable seating and plenty of room for casting. Lady L always welcomes families and corporate outings. The boat is docked at the Marine Basin Marina in the Lower New York Bay. Though located in Brooklyn, the marina is in close proximity to Long Island and parts of NJ; making the charters perfect for fishing trips in the early morning, before work, or after work. Fish with Two Experienced Captains! Captains John Calamia and Rob Miglino of Whatta Catch Sport Fishing have been fishing the NY bight area since they were children. With a combined experience of 50 years on the ocean, they will make sure you have an enjoyable, safe, and successful fishing trip. The fishing charters are available for both tournaments and corporate outings. Whatta Catch caters to beginners and families, as well as more experienced anglers. If your kids need instruction on how to fish, the Captains will be more than glad to provide them with fun and informative lessons. The New York fishing charters set sail from St. Patrick's Day through January (weather-permitting). One of the Best Fishing Boats in NY! Take a break from the ordinary with Rocket Fishing Charters in New York! 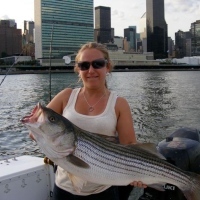 While aboard one of NY's finest sport-fishing charter boats, you'll catch some of the East Coast's most sought-after gamefish while taking in the beautiful NYC skyline. Rocket Charters was even featured in New York Magazine as the "Best of New York"! "The Rocket" is a perfectly designed boat that allows you to fish the NY Harbor without a hitch. Glide across the water at speeds over 30 knots! The boat comes fully equipped with topnotch navigational and safety equipment--including RADAR, SONAR, LORAN, GPS, and a VHF radio and cellular telephone. With a private bathroom, bunks, and changing areas; you'll be given all the comforts of home! Open Boat Fishing in NY! 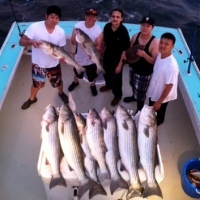 Setting sail 7 days a week, Never Enuff Fishing features the only open fishing boat in Queens. The 65-foot boat can accommodate anywhere from 1 to 70 passengers, and departs from World's Fair Marina in NY. The 27-foot custom down east boat is available for groups of 1-6 people, and departs from Manhasset Bay on Long Island. Family discount rates are available. Upon request, group rates are available for all organizations. Daytime fishing hours are from 7 A.M. to 2 P.M. Evening fishing hours begin at 6:30 P.M. If you require any additional information, please send an e-mail to neverenufffishing@hotmail.com. Trophy Class Striped Bass Fishing in New York! 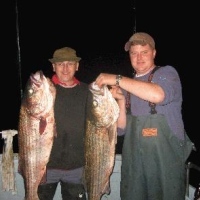 Experience trophy class striped bass fishing at its finest with Angler Charters. With over 25 years of experience on the waters, the crew will gladly share their knowledge and fishing techniques with you. Being a family-oriented business, children are always welcome aboard. The Angler II is a well-maintained vessel that contains only the highest quality fishing equipment (i.e. : WAAS-supported GPS, depth and fish finders, VHF radio telephone, radar), guaranteeing a perfect day on the water. Fish for striped bass, fluke, bluefish, weakfish, tog, and sea bass during your fun-filled fishing adventure. With shelter from the wind and rain, you will get to fish in total comfort. From mid-June through November, the boat is docked at New York's Mansion Marina. 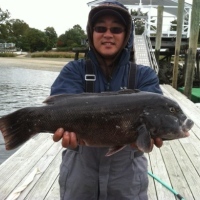 A World-Class Sport-Fishing Charter in NY! Offering world-class sport-fishing charters on the Hudson River and Lake Ontario, Upstate Charters allows you to enjoy a fishing trip that you will remember for years to come! 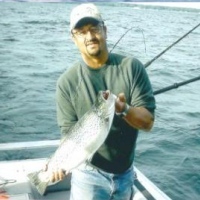 The NY fishing charters are led by Captain Joe DeMarco, who has over 25 years of experience on the Hudson River and Lake Ontario. To guarantee safety, he will always take the time to explain all aspects of your fishing trip. The 23-foot Starcraft Islander boat contains a hardtop with side curtains and a drop curtain to keep you warm on the colder days. The boat also contains such electronics as a Si-Tex Color Video Sounder, a Lowrance Video Sounder, a Moor Sub-Troll, Cannon Mag 15 Downriggers, and a Garmin GPS/Chart Plotter. All of the boat's safety equipment is approved by the U.S. Coast Guard. Wonderful NY Fishing on Lake Ontario! No fishing experience is necessary at Reel Crazy Charters in New York. 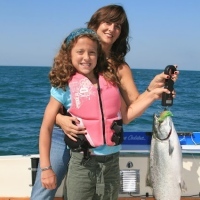 Located near Rochester, the New York fishing charters are great for family days, corporate outings, and other fun events. Fish for salmon, trout, bass, and other underwater creatures. The rods, reels, lures, and other pertinent tackle will all be provided for you. Master Captain Mark Brozowitz possesses over 30 years of experience fishing on Lake Ontario, as well as a genuine passion for the sport. You can rent a fishing boat for half the day (5 hours) or for the full day (8 hours). Check the website for current rates. 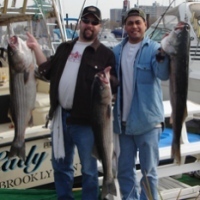 The NY fishing charters are available from April through October.